Looking for guidance in so far as the proper wiring interconnect of a 72' 510 horn to an aftermarket Momo Corse horn button / steering wheel / hub assy. To be clear, I am a complete newb electrical wise. I do have the colored wiring diagram for the 510 sedan and it seems to align with the horn circuit as I compare the diagram to what I am seeing in the engine compartment and over at the turn indicator/Hi-Lo/Horn connector located on the column. For what it's worth, Fuse box has been given a thorough vinegar bath mid 2017. The following all function properly...., turn indicator, emergency flashers, Hi-Lo lights, Dome light, heater switch, 2 speed wipers and gauges. So...., recommendations on how to proceed from here would really be greatly appreciated. Thanks! The Black/Green wire from the horn relay conducts power to the horn switch through this contact. 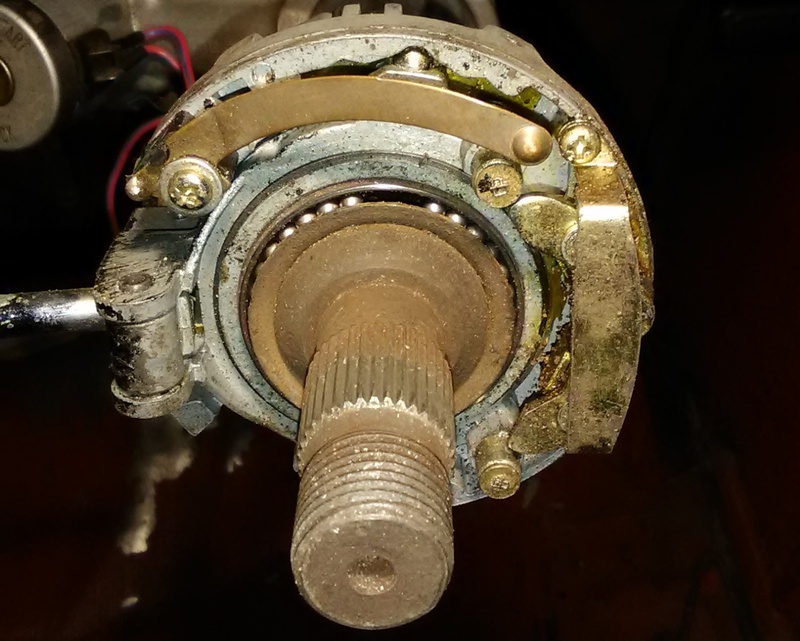 Been a while since I've seen the inside of a Momo hub adapter, but generally there's a copper or brass ring on the bottom of the hub adapter that rides over the spring arm maintaining constant electrical contact with the spring arm no matter how the wheel is turned. On your red wire, the spade connects to the button like it was before you removed it. The other end with the coil spring connects inside your hub adapter somehow to make contact with the ring which is in contact with the spring arm. So power comes from the horn relay BG wire to the turn signal assembly, through the spring arm, to the hub adapter ring, through your red wire into the button. Pressing the button makes an internal connection from your red wire to the thick steel wire on the side of your horn button which grounds to the steering wheel frame when the button is in place, and your horn honks. Thanks for the clear description above Ted. I have had intermittent horn on all the time/on when it should be/off all the time problems since I built my car 16 years ago. It is in the latter condition now and all that stands between me an state inspection, this should help a great deal. Defdes your going to need that whole contact piece and wire that screws down around the shaft. Start asking if anyone has this part or you could possibly make one but I'd get an original. Thanks, I have yet to tear into it, I have one of the Grant "no wheel no steal" hubs and steering wheel. It did work at one time so I am fairly sure that that brass contact is still under there. there is likely an issue in the contact from the Grant piece to it. I should have either whatever parts you need for the horn at the steering column, or I will have a good USED turnsignal switch with everything you need!